Astral Spirit is my Native American name, lived in the UK since I was 7, now 51. 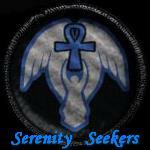 Serenity Seekers is my fleet on STO, but ave no members. I was a big Star Trek fan since I was a kid, & not just because it was a good tv program, it was the first & only thing that was more than the sum of it's parts ... until Firefly. Sadly, CBS mammonists proved they didn't care about what Star Trek has done for Western Science, or the fans of the show, they long before they cancelled Enterprise they destroyed Star Trek in grand fashion in Generations. Fox did the same thing with firefly, morons, & this has been proved many times since. They should go out of business, but WHY hasn't firefly returned, especially when it should be obvious to any corporate mammonist it would be successful. What is taking so long?? ?